When Ma Chao attacks a player, he can flip a judgment card. If it is red, the attack cannot be escaped. Ma Chao's "Horsemanship" gives him a bonus that stacks with another -1 horse when he has one equipped (i.e. if he has a -1 horse equipped, Ma Chao has a physical range bonus of 2 and could reach someone three spaces to his right or left). Ma Chao's "Iron Cavalry" is activated before another character plays an Escape. This means that Ma Chao cannot wait to see if the opponent has an escape then activate the power to waste the Escape. If Ma Chao targets multiple opponents with the same attack, he flips a judgment card for each player individually. Ma Chao's "Horsemanship" is very useful as it increases not only his attacking range, but also his range for Steal and Starvation. It also helps him get around enemy +1 horses. 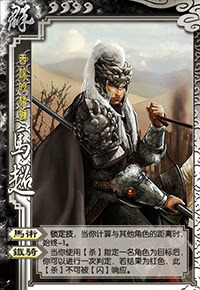 "Iron Cavalry" is very potent against defensive characters like Lu Meng, Zhen Ji, and Zhao Yun. It can also neutralize the Eight Trigrams. Iron Cavalry can be unreliable. It has a 50% chance of failing and he cannot rely upon it to always deal damage. Iron Cavalry is subject to judgment tinkers. If these tinkerers are not on Ma Chao's team, they can easily make his power useless. Sima Yi and Zhuge Liang - These characters can be allies or enemies. 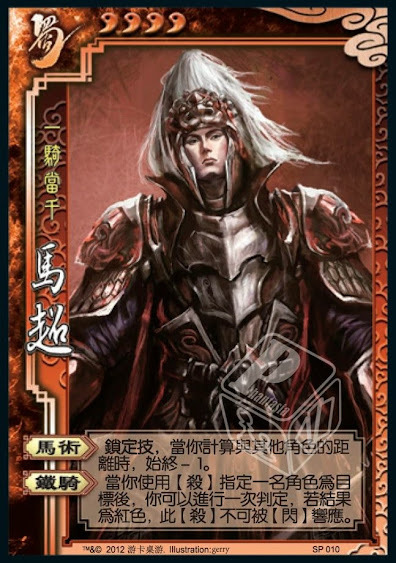 Sima Yi can influence the judgement card of "Iron cavalry" with one of his hand cards and Zhuge Liang can make sure the fifth card on the top of the deck is red, assuming that he has his turn immediately before Ma Chao's turn. Zhang Jiao - One would think that Zhang Jiao would have a disadvantage against Ma Chao as Ma Chao can flip a judgement to possibly make his Attack inescapable. 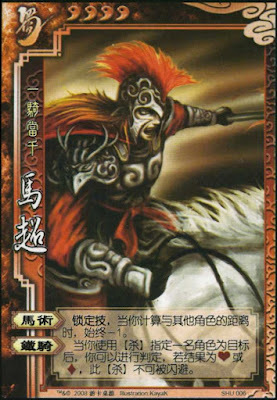 However, Zhang Jiao has the advantage, as he can swap out the red judgement card with a black one, allowing him to Escape the Attack. 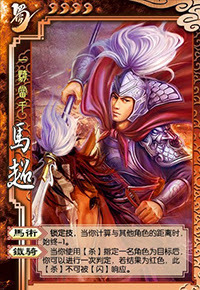 In addition, the judgement card that Ma Chao flips might be an Escape. King Ma Chao is not a good king choice because he does not have any defensive abilities. Ma Chao is a decent loyalist due to his offensive prowess. Rebel Ma Chao is a very good rebel. His "Iron Cavalry" could make his Attack inescapable and his "Horsemanship" makes it easier for him to reach the king. Spy Ma Chao is not a bad spy, but he is not outstanding. 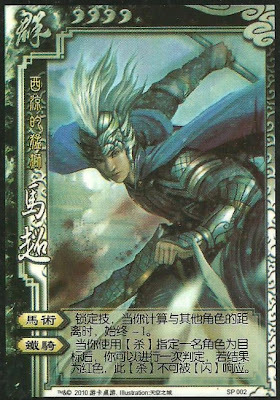 As with most of the other Shu generals in the base set, Ma Chao does not have many advanced strategies to employ. This is not to say that Ma Chao is not a good character, but there really is not too much to say about him. He is competent in most roles and outstanding as a rebel unless the king is Zhang Jiao.